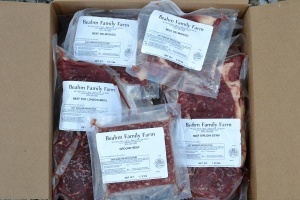 Beahm Family Farm- Grassfed Beef and Pastured Pork for NOVA families. We’re Timothy and Julie Beahm and our family of seven seeks to work together living, learning, farming, and helping to bring healthy meat to local families again. 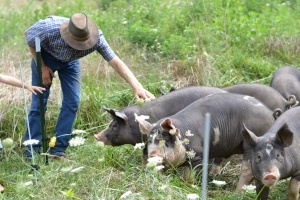 In the beautiful mountains of Rappahannock County, we raise Grassfed Beef and Pastured Pork. We believe in simple living and simple farming practices. The best food starts with the best farming practices. We desire to honor the Creator, the animals, and the land by the way we raise them. If you are looking to take steps towards good health by eating pastured and grassfed meat and buying local, then read on! Where we get our food is important to our family. -Ethical reasons. They like to know that the animals are raised in a natural environment that is best for them. -The local connection. Some people just really want to get their food from an actual, real person that they can talk to, ask questions, get cooking advice- all the advantages that you don’t get with the big companies selling food at the grocery store. Most of us have some goals in mind for better health. You may have heard that grassfed beef is higher in omega 3’s, or that pastured pork is more flavorful due to their varied diet without all the added preservatives and junk in the finished meat. You may be trying to eat healthier and desire to have a cleaner food source coming into your home. We get that! That’s why we love doing what we do, even on all the hard days when we take care of animals in the rain, wind, snow, and dead heat of summer! We believe so strongly that the key to better health should begin with the very fuel we are feeding our bodies. Even though we are grateful for medical intervention and medicines when needed, it’s crucial to begin working from the inside out to help start on the path to a healthier you. Our beef are raised and finished on grass entirely. No grain ever. We don’t use antibiotics, hormones, or pesticides on them. Our beef has rich flavor and is naturally leaner. 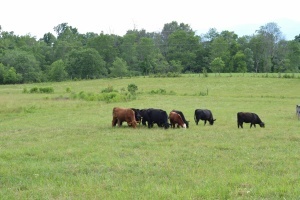 We improve the land by rotating our grazing and giving our beef optimal forage for their healthy diet. Our beef are carefully raised and gently treated. Our pigs live a happy life rooting in the pasture and woods. They are never treated with antibiotics or pesticides. They are omnivores and love eating all kinds of forage and bugs. Their meat is nitrite, nitrate, and preservative free. Because of pigs natural rooting tendacies and turning over the soil, they improve the land by regenerating growth. 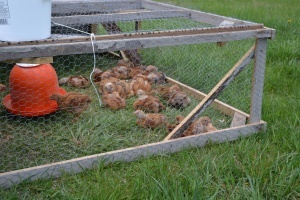 We raise our meat chickens on pasture, under a shelter, protected from predators. Their diet is supplemented with non-GMO feed. We never use hormones or antibiotics on our birds. They have freedom to move around and live on pasture. We love our meat from the Beahm Farm, especially knowing where it came from and that we can trust we are eating healthy, So glad we found The Beahm family! We have multiple options for both grassfed beef and pastured pork that can meet any family’s needs and help bring healthy meals again to your table. 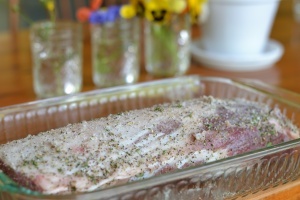 ½ shares of beef and pork are the most economical and can last some families a whole year. We offer 30, 60, and 90 lb. shares of beef or pork as well. The small 30 lb shares can easily fit in most refrigerator freezers. We have easy step-by-step instructions for ordering your year’s supply of meat with 1/2 shares of beef or pork. Most customers make an appointment to pick up their meat shares at the farm, but we do offer delivery to some areas. “Just ate the best bacon I have ever had in my life, thanks Timothy and Julie…the best.” -Carol D.
We have recipes and actions tips for kitchen efficiency and meat organization over on the blog.